Celebrate Halloween 2017 at Win A Day Casino with a free chip and some deposit match bonuses. Start by claiming your free chip so you can start playing on the house now. Regular players will get a $12 no deposit bonus, and VIP players will get a $20 bonus. Players must wager this bonus 21 times on slots and keno only. You may cash out a maximum of 10 times the free chip amount. This free chip is only for players who have made at least one deposit in their account. You can also claim a 115% match bonus to play the Haunted Slot when you make a deposit between $25 and $500. You must wager this bonus 21 times on the Haunted Slot only. You can also claim another match bonus, and the more you deposit, the bigger your bonus will be. Deposit between $25 and $49 and claim a 25% match bonus. Make a deposit between $50 and $89 and claim a 50% match bonus. If you deposit between $90 and $200 you can claim a 65% match bonus. Deposit between $201 and $250 and claim the maximum bonus, an 80% deposit match bonus. You must wager this bonus 17 times on slots, keno and video poker. There is no maximum cash out, so there is no limits on the amount you may win. You may claim this bonus 4 times per day. Last but not least, you can claim a 150% match bonus to play mobile slots when you make a deposit between $40 and $500. You must wager this bonus 26 times on mobile slots only. All of the bonuses listed above are only valid until October 31st 2017 at 11:59 PM EDT, so be sure to claim them now. Don’t miss out on your chance to play. Claim your Win A Day Casino Halloween 2017 bonus codes so you can start playing now. Claim a no deposit bonus and some deposit match bonuses to play the new Chinatown Slot and celebrate the 19th birthday of Slotland Casino. Start by claiming a $20 freebie so you can start playing with no deposit needed. You must wager this bonus 23 times. Regular players may cash out a maximum of 5 times, and VIP players may cash out a maximum of 10 times the bonus. You may also claim a 250% deposit match bonus. Players must wager this bonus 23 times on slots and keno only. You may claim this bonus twice on deposit of $50 or more. Claim a 175% match bonus when you make a deposit. You must wager this bonus 17 times on all slots and keno, and this bonus is only valid for mobile play. Because of this, you must claim this bonus from a mobile device. A 125% match bonus is also waiting for you when you make another deposit. Players must wager this bonus 14 times on all slots and keno. Finally, you can claim a 70% deposit match bonus. You must wager this bonus 10 times on all games, therefore you can choose to play any game with this bonus. You may claim this bonus twice a day. All of the bonuses above are only valid until October 15th 2017, so be sure to claim them now. Claim your Slotland Casino Chinatown Slot Birthday bonuses so you can start playing to win now. Claim some nice bonuses to celebrate the 19th birthday of Slotland Casino. Get a no deposit bonus, plus a bunch of match bonuses to boost your bankroll. Start by claiming a $19 free chip so you can play with no deposit needed. You must wager this bonus 20 times. Regular players may cash out 6 the amount of this bonus and VIP players may cash out 12 times the bonus amount. These bonuses can be used to play any slots, table games or Keno. There is a 190% deposit match bonus also up for grabs. Players must wager this bonus 21 times. You can also claim a 90% deposit match bonus when you make a purchase. You must wager this bonus 13 times and you can claim this bonus up to 5 times. Because of this, you cab boost your bankroll with this bonus more then once. All of the bonuses above may be used to play slots, keno and table games only. If you like playing Video Poker you can claim a 50% match bonus when you make a deposit. Players must wager this bonus 13 times on Video Poker only. You may claim this bonus up to 4 times, therefore you can boost your bankroll and play video poker with four deposits. All of the bonuses above are only valid until October 8th 2017, so be sure to claim them now. Claim your Slotland Casino 19th Birthday bonuses so you can play now. 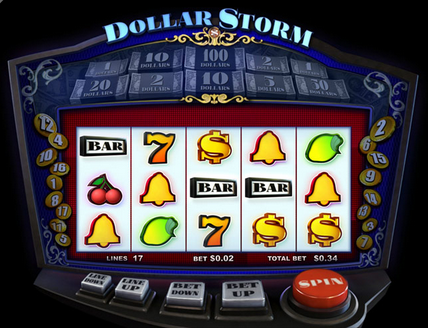 Play the Dollar Storm Slot at Slotland Casino with some nice bonuses. Get a no deposit bonus, plus claim some match bonuses when you deposit. Start by claiming a free $15 bonus so you can start playing the Dollar Storm Slot with no deposit needed. Players must wager this bonus 23 times. You may cash out 8 times the bonus amount if you are a regular player, and 15 times if you are a VIP player. You may also claim a 200% deposit bonus when you make a purchase. You must wager this bonus 21 times. Make another deposit and claim a 100% match bonus. Players must wager this bonus 20 times, and may claim this bonus twice per day. Because of this, you can use this bonus more then once. Please note that all of the bonuses above are only valid to play the Dollar Storm Slot. You may also claim a 70% deposit match bonus when you make a purchase. Players must wager this bonus 13 times on all slots and progressive jackpot games. Finally, claim a 35% match bonus when you make a deposit. Players must wager this bonus 10 times on all games. All of these bonuses are only valid until September 18th 2017, so be sure to claim them now. Claim your Slotland Casino Dollar Storm Slot bonuses so you can try this new slot game now. 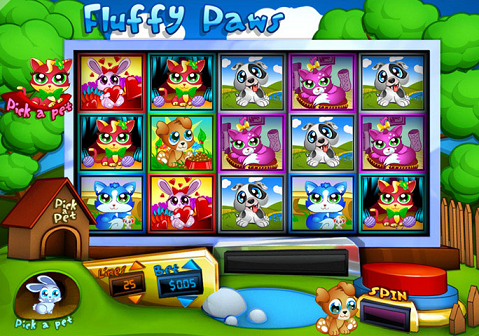 Play the Fluffy Paws Slot at Slotland Casino with a free chip, plus some deposit match bonuses. Because of this, you can have more chances to play and win. Start by claiming a $10 free chip is you are a regular player, or a $20 free chip is you were a VIP player. Players must wager this bonus 20 times. Regular players may cash out a maximum of 8 times the bonus amount, and VIP players may cash out a maximum of 15 times the bonus amount. Please note that this bonus is only valid for the Fluffy Paws Slot. You may also claim a 125% match bonus when you make a deposit. You may wager this bonus 21 times on the Fluffy Paws Slot only. Also claim an 80% deposit match bonus. Players must wager this bonus 18 times on all slots, keno and progressive jackpot games. You can also claim a 60% match bonus when you make a deposit. You must wager this bonus 13 times on slots, keno and progressive jackpot games, and you may claim this bonus two times per day. If you are looking for a bonus that is valid to play all games, you may claim a 35% match bonus when you make a deposit. This bonus must be wagered 10 times on all games, and may be claimed twice a day. These online casino bonuses are only valid until August 16th 2017, so be sure to claim them now. Get your Slotland Casino Fluffy Paws Slot bonuses so you can start spinning to win now. Play the new Pyramid Plunder Slot at Slotland Casino with a free bonus, plus get some match bonuses when you deposit. Start by claiming a $17 free chip with no deposit needed. You must wager this bonus 20 times on the Pyramid Plunder Slot. The maximum cash out is 6 times the bonus amount for non-VIP’s, and 15 times for VIP players. This free chip may only be claimed by players who have made at least one deposit into their casino account. You may also claim a 200% match bonus when you make a deposit. Players must wager this bonus 25 times on the Pyramid Plunder Slot. Make another deposit and you may claim 100% match bonus. If you want to boost your bankroll even more, claim an 80% deposit bonus when you make another deposit. Players must wager this bonus 14 times on slots, keno and progressive jackpot games. This bonus may be claimed twice per dad, therefore you can boost your bankroll more then once. If you are looking for a bonus to play more games, claim a 35% deposit match bonus. You must wager this bonus 10 times on all games. This bonus can be claimed two times per day. All of the deposit bonuses listed above have no maximum cash out, therefore your winnings are limitless. These casino bonuses are valid until July 31st 2017 at 11:59 PM EDT. The new Pyramid Plunder Slot is available for play on the desktop version of this casino. Because of this, you will need to access the casino from your PC to play this new game. Bet $5 or more per spin and play for your chance to win the jackpot. Don’t miss out on your chance to play with all of these great bonus offers. Claim your Slotland Casino Pyramid Plunder Slot bonuses so you can start playing now. Give the new Trip to Japan Slot a try at Win A Day Casino with some great bonuses. Also claim some nice bonuses to play some other games, including one for roulette. If you have made at least one deposit at this casino you can claim a free bonus. Because of this, you can play with no further deposit needed. Non VIP’s may claim a $20 free chip, bronze VIP’s can claim a $40 freebie, silver VIP’s can claim a $70 no deposit bonus, gold VIP’s may claim a $100 freebie, and platinum VIP’s can claim a $150 free chip. You must wager this bonus 25 times on slots and keno only. You may cash out 5 times the amount of the free chip, therefore the higher your VIP status, the more you may cash out. Please note that this free bonus may only be claimed by players who have made at least one valid deposit into their account. Be sure to also claim your 200% deposit match bonus and play the new Trip to Japan Slot. Players must wager this bonus 27 times on the Trip to Japan Slot only. You can also claim a 150% deposit match bonus, this boosting your bankroll and giving you more chances to play and win. You must wager this bonus 25 times on all slots and keno games. Claim an 85% deposit match bonus when you make a purchase. Players must wager this bonus 18 times on slots and keno, and may claim this bonus once per day. Be sure to also claim a 60% match bonus when you make a deposit. You must wager this bonus 16 times on slots, keno and video poker, and you may claim this bonus twice per day. Finally, you can claim a 30% deposit match bonus to play roulette. Players must wager this bonus 16 times on roulette only, and may claim this bonus 2 times per day. All of the bonuses above are valid until Wednesday June 28th 2017 at 11:59 PM EDT. Don’t miss out on your chance to play with all of these great offers. Sign up and claim these Win A Day Casino Trip to Japan Slot bonuses now. Play the new Tropical Treat Slot at Slotland Casino with some nice bonus offers. Claim a free chip with no deposit needed, plus get some great match bonuses to boost your bankroll. Start by claiming your no deposit bonus. All players that have a previous deposit can claim a $10 freebie, and VIP players can claim a $20 free chip. All players that have made at least one prior deposit are eligible to claim this offer. You may cash out a maximum of 10 times the bonus amount, and VIP players may cash out 15 times the bonus amount. This free bonus may only be used to play the Tropical Treat Slot. Be sure to also claim some of the deposit bonuses being offered for a limited time. Get a 125% match bonus when you make a deposit. Players must wager this bonus 19 times, and may only play Tropical Treat Slot. Because of this, be sure to follow the bonus rules and only play the new slot when using this bonus. Claim an 80% match bonus when you make a deposit. You must wager this bonus 12 times on all slots, keno and progressive jackpot games. Deposit and claim a 60% match bonus. Players must wager this bonus 10 times on all slots, keno and progressive jackpot games. This bonus may be used twice per day, therefore you can claim it multiple times. Get a 35% deposit match bonus. Players must wager this bonus 10 times on all games. Because of this, you may play any game when using this bonus. You can claim this bonus twice per day, thus allowing you to boost your bankroll 2 times per day. All of the bonuses above are valid until June 13th 2017 only, so be sure to claim them now. Don’t miss out on your chance to try this new slot game with these great offers. Claim these Slotland Casino Tropical Treat Slot bonuses now, thus giving you more chances to play and win. Win A Day Casino has recently received a complete mobile makeover. Because of this, games and deposits can now be enjoyed on any mobile device. To celebrate, and to give you a chance to try this new mobile casino, you can now claim some nice bonuses. Start by claiming a free $18 no deposit bonus to try the new mobile casino now. You must wager this bonus 15 times on mobile slots only. You may cash out a maximum of $100. Also be sure to claim a 222% mobile casino deposit match bonus. Players must wager this bonus 20 times on mobile slots only. These mobile casino bonuses are valid until March 14th 2017, and may be claimed by both new and existing players. Don’t miss out on your chance to play with these great bonuses, thus giving you something extra. Claim your free $18 no deposit bonus to try the mobile casino games for free. After you have played with your free money, be sure to then claim your match bonus, thus boosting your deposit. Because of this, you will have more chances to play and win. Sign up and claim these new Win A Day Mobile Casino bonuses now. Claim some nice bonuses for Valentine’s Day 2017 at Win A Day Casino. Use these bonuses to play the newly released romantic themed Amore Slot. Start by claiming a no deposit bonus worth either $10 or $21 depending on your player status. Players must wager this bonus 10 times on slots and keno only. This free chip is valid for players who have made at least one deposit. VIP players will receive $21 free, and non VIP’s will receive $10 free. You can also claim a 200% match bonus when you make a deposit between $35 and $250. You must wager this bonus 20 times on the Amore Slot only. Be sure to claim a 100% match bonus when you make a deposit between $25 and $250. This bonus must be wagered 15 times on mobile and slots only. Boost your bankroll with a 70% match bonus when you make a deposit between $25 and $250. Players must wager this bonus 12 times on all slots and keno. Players may claim this bonus 2 times per day. Finally, claim a 35% match bonus when you make a deposit between $25 and $150. You must wager this bonus 12 times on video poker only. This bonus may be claimed 2 times per day. All of the bonuses above are valid from February 14th to February 20th 2017, so be sure to claim them now. Don’t miss out on any of these great Valentine’s Day 2017 bonus offers. Claim these Win A Day Casino Valentine 2017 bonuses now, thus giving you more chances to play and win. The new Robot Escape Slot has just launched at Win A Day Casino, and to celebrate you can claim some nice bonuses. Get a no deposit bonus, plus two different deposit match bonuses. All previous depositing players can claim a $12 free chip. Players must wager this bonus 7 times. You can also claim an 80% match bonus when you make a deposit. This bonus is valid for all slots and keno games, and may be used once per day. Players may also claim a 50% deposit match bonus. You may use this bonus twice per day on all slots and keno games. All of the bonuses listed above are valid until January 15th 2017. Because of this, you will want to claim them now. Don’t miss out on any of these great offers. Claim these Win A Day Casino Robot Escape Slot bonuses now, thus giving you more chances to play and win. Claim a free chip and some nice match bonuses to celebrate Christmas 2016 at Slotland Casino. Start by claiming a $17 free chip with no deposit needed. Because of this, you can start playing on the house instantly. You must wager this free bonus 18 times on slots and progressive jackpot games. $102 maximum cash out is allowed. You can also claim some nice Christmas match bonuses when you make a deposit. Start by claiming a 200% deposit match bonus. You must wager this bonus 19 times on slots and progressive jackpot games. You can claim this bonus once. Also be sure to claim a 150% match bonus when you make another deposit. 17 times play through is needed on slots and progressive jackpot games. Players may claim this bonus once. When you make another deposit you can also claim an 80% match bonus. You must wager this bonus 12 times on progressive jackpot games and slots. You can claim this bonus twice per day. Finally claim a 40% match bonus when you make a deposit. Players must wager this bonus 8 times on all games. You may claim this bonus 3 times per day, therefore you can boost your bankroll multiple times. All of these bonuses are valid until Monday December 26th 2016 at 11:59 PM EST. Don’t miss out on all of these Christmas 2016 bonuses at Slotland Casino. Claim them now, thus boosting your bankroll and giving you more chances to win. Get a free chip and some match bonuses to celebrate Christmas 2016 at Win A Day Casino, thus boosting your bankroll giving you more chances to win. Start by claiming a $15 free chip now, therefore allowing you to start playing with no deposit needed instantly. Players can also claim a 50% match bonus when they deposit a minimum of $25. You can claim this bonus up to 3 times per day. Make a deposit over $30 and claim an 80% match bonus for Christmas 2016. This bonus can be claimed twice per day. If you deposit $35 or more you can claim a 200% deposit match bonus. If you choose to deposit $35 or more and would like a bonus with lower wagering requirements, you can claim a 100% match bonus instead. This bonus will have a lower play through, therefore you will not need to wager as much before you cash out. You are allowed to play all slots and keno games when using these bonuses. All of the bonuses above are valid from December 19th to 26th 2016. Because of this, be sure to claim them now. Don’t miss out on any of these Win A Day Casino Christmas 2016 bonuses. Be sure to claim them now, thus boosting your bankroll, giving you more chances to play and win. Sign up at Slotland Casino and claim some exclusive bonuses just for signing up from the 123 Online Casino Bonuses site. Get an exclusive $33 no deposit bonus, plus an exclusive 250% match bonus on your first deposit. Start by claiming your $33 exclusive no deposit casino bonus now. Players must wager this bonus 20 times on all game before requesting a withdrawal. Be sure to also claim your 250% exclusive deposit match bonus when you make your first purchase. No bonus code is needed to claim this exclusive offer. Simply sign up from any link within this site, and your bonus will be credited automatically when you make your first deposit. You can claim a maximum bonus amount of $250. Players must wager the bonus 12 times, and the deposit once on all games before requesting a withdrawal. There is also no limit on the amount you can withdraw, therefore your winnings are limitless. Please note that both of the bonuses listed above are exclusives, therefore you must sign up from this the 123 Online Casino Bonuses site to be able to claim them. This casino offers many different and unique games for you to choose from, and has been online since 1998. Because of this, it has become a highly trusted brand among players. Don’t miss out on your chance to try this unique casino for free with this exclusive no deposit bonus, plus give your bankroll a boost with the deposit match bonus. Claim these Slotland Casino exclusive bonus coupon codes now, thus giving you more chances to play and win. Claim some bonuses to celebrate Halloween 2016 at Win A Day Casino. Get a no deposit bonus, plus some nice deposit match bonuses. Start by claiming a free $15 bonus with no deposit needed now. Players must wager this bonus 17 times on all slots before requesting a withdrawal. Regular players may withdraw 7 times the bonus amount, and VIP players may withdraw 15 times the bonus amount. Be sure to also claim an 80% deposit match bonus when you make your next purchase. Players must wager this bonus 17 times on all slots and keno games. There is no maximum cash out when using this bonus, and you can claim this bonus 2 times per day. Therefore you can use this bonus more then once, giving you more chances to play and win. Also, do not miss out on a 50% match bonus when you make another deposit. Players must wager this bonus 12 times on all slots, keno and video poker games. There is no maximum cash out attached to this bonus, and players may claim this bonus 3 times per day. Because of this, you can boost your bankroll more then once with this bonus code. All of these bonus are valid until Tuesday November 1st 2016 at 11:59 PM EDT. Don’t miss out on any of these great offers. Claim these Win A Day Casino Halloween 2016 bonuses now. Sign up at Win A Day Casino and claim our exclusive bonuses. Get a free $32 bonus with no deposit needed, plus claim a 250% match bonus when you make a deposit. Start by claiming our exclusive $32 no deposit bonus now. Players must wager this bonus 20 times before requesting a withdrawal. Players are allowed to cash out a maximum of $100 when using this free bonus. Be sure to also claim our exclusive 250% match bonus when you make a deposit at this casino. Players can claim this exclusive deposit match bonus up to a maximum of $250 free. Players must wager the bonus amount 10 times before requesting a withdrawal. The deposit amount itself has no wagering requirements attached to it. Please note that these are exclusive bonuses, and you must sign up from a link within the 123 Online Casino Bonuses site to be able to claim them. Use the free bonus to start playing with no deposit needed, then use the match bonus to give you more money on your deposit. Because of this, you will have more chances to play and win. This is also a great way to try some of the unique games this casino has to offer. Don’t miss out on either of these great offers. Sign up and claim these free Win A Day Casino exclusive bonuses now, therefore allowing you to boost your bankroll before you start to play. Get a free $15 bonus to celebrate Fathers Day 2016 at Win A Day Casino. Claim this $15 no deposit casino bonus now. 20 times play through is required. This free bonus is valid until June 20th 2016, so you will want to claim it now before it expires. This casino offers some very unique slots that you won’t find at other casinos, and this bonus is a great way to try them for free. Don’t miss out on your chance to play for free this Fathers Day. Claim this Win A Day Casino Fathers Day 2016 bonus worth $15 now. 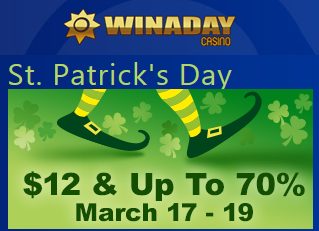 Claim some bonuses to celebrate St. Patrick’s Day 2016 at Win A Day Casino. Get a no deposit bonus, plus boost your bankroll with some extra cash when you make a deposit. Start by claiming your free $12 no deposit bonus for St. Patrick’s Day 2016 now. 19 times play through is required. You can also claim a 70% deposit match bonus. 16 times play through is required on slots and keno only. This bonus can be claimed when you deposit between $30 and $250. You can also claim another deposit match bonus where the percentage depends on your deposit amount. Deposit between $25 and $100 and get a 30% bonus, deposit between $101 and $250 and get a 50% match bonus. This bonus can be claimed up to 5 times per day. 12 times play through is required on slots, keno and video poker only. All of these bonuses are valid from Thursday March 17th 2016 at 12:01 AM EST, until Saturday March 19th 2016 at 11:59 PM EST. Don’t miss out on these offers. Claim your Win A Day Casino St Patricks Day 2016 bonuses now. 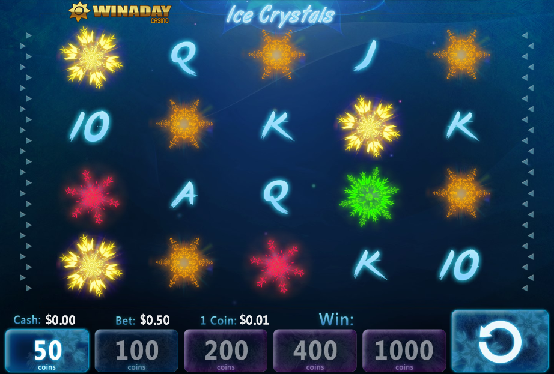 Try the new Ice Crystals Slot at Win A Day Casino with a free $19 bonus, plus get some deposit match bonuses to boost your bankroll as well. Start by claiming your free $19 no deposit bonus now. 21 times play through is required on the Ice Crystals Slot. 5 times maximum cash out is allowed for non VIP players, and 15 times maximum cash out is allowed for VIP players. You can also claim a 150% deposit match bonus. This bonus can only be claimed once. 21 times play through is required on the Ice Crystals Slot only. You can also claim a 75% deposit match bonus. This bonus can be claimed once each day. 16 times play through is required on the new Ice Crystals Slot. There is also a 50% deposit match bonus waiting for you to claim. This bonus can be claimed an unlimited amount of times. 14 times play through is required on the Ice Crystals Slot only. These deposit match bonuses have no maximum cash out attached to them. All of the bonuses above are valid until Thursday March 17th 2016 at 11:59 EST. Don’t miss out on your chance to try this brand new slot game. Visit Win A Day Casino and claim your bonuses to play the new Ice Crystals Slot now. 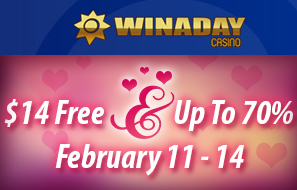 Claim a free $14 casino bonus plus a 40% and 70% match bonus to celebrate Valentines Day 2016 at Win A Day Casino. Start by claiming your free $14 no deposit bonus now. This free $14 bonus has a maximum cash out of 5 times for non-VIP players, and a 10 times maximum cash out for VIP players. You can also claim a 40% match bonus when you make a deposit. This bonus can be claimed and unlimited amount of times. 13 times play through is required on slots, keno and video poker. There is no maximum cash out when using this bonus. Be sure to also claim your 70% deposit match bonus. You can claim this bonus a total of three times on three separate deposits. 18 times play through is required on slots and keno only. All of the above casino bonuses are valid until Sunday February 14th 2016 at 11:59 PM EST. Don’t miss out on these offers. 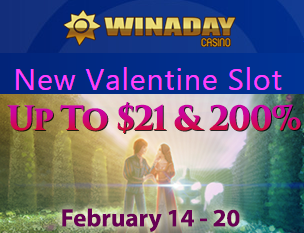 Claim these Win A Day Casino Valentines Day 2016 bonuses now. You are currently browsing the Slotland Entertainment category.